It’s 10:43 and I should be asleep. I get up 7 hours and 17 minutes from now. Anything less than 8 hours of sleep does not work for me. 2,048 direct ancestors in the past 10 generations, to be exact. 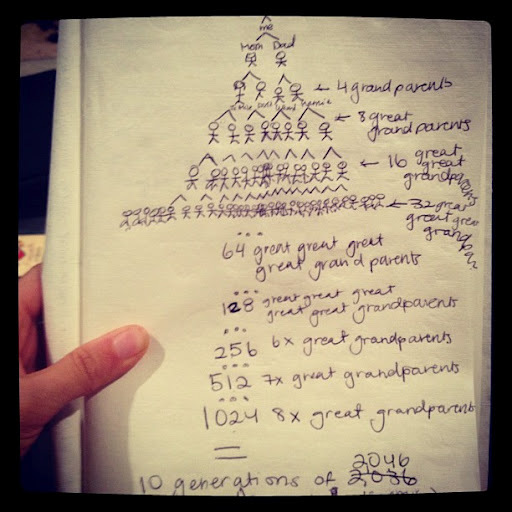 Two parents, four grandparents, eight great grandparents, 16 great great grandparents… I feel like I have the Math Curse that my students love so much. Oops on the 2,046 instead of 2,048… Apparently my mental math isn’t as good as my fourth graders’! Ten generations probably only gets me back around 300 years, (conservatively assuming each generation has children about every 30 years). That means, we really have thousands of direct ancestors, far more than the 2,048 that I was patient enough to calculate. And, it does not even take into account all of the great aunts, second cousins, etc. that we’re genetically connected to, (or their thousands of separate descendants). The more I start to think this way, the more I start to feel like the whole world must somehow be related. I guess it doesn’t help that my dad found some MacKays related to us in the 1600s, (I don’t think this automatically qualifies me as being related to my husband, right?). What I also find interesting about all of this is that even though I connect most with my paternal last name, I really have countless last names in my background that are just as responsible for me being here. According to my dad’s recent family tree research, which gets a couple of our lines back to the 1600s, I am just as much German, French, Prussian, and English as I am Irish, but since my last name is O’Bryon, I’ve always connected most with this piece of my heritage. It’s fascinating to think that we’re really the result of so many people from so many backgrounds. I have ancestors that lived in the original colonies, ancestors that were Native Americans, ancestors that migrated only a couple of generations ago from Prussia. I am so many people. You are too. The math nerd in me can’t get over this. 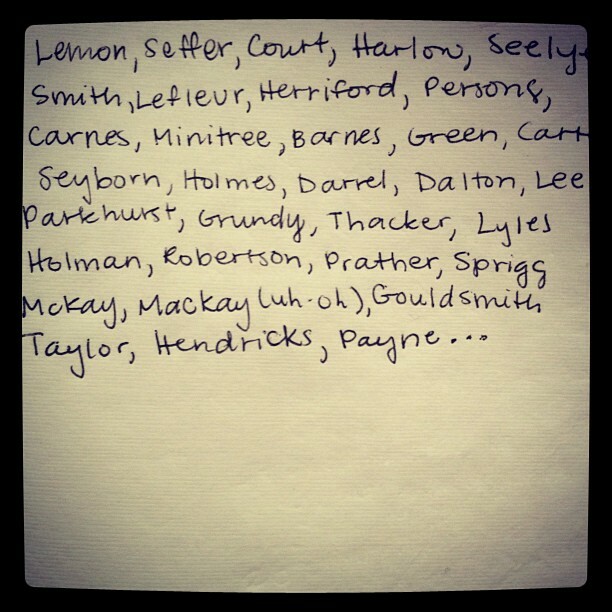 A partial list of the last names in my background over the past few hundred years, maybe we’re related!